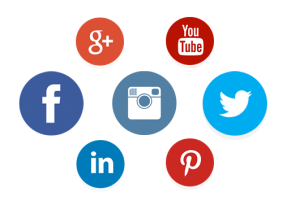 If you want to tap into the immense traffic from social media sites like Twitter, Facebook, Google+, Instagram and many others, our skilled and experienced social media experts are ready to help you come up with a winning strategy, customized to suit the specific needs of your business in social media marketing. It is a fact that the social media is a hot buzzword in the current times. For most people, social media is the place they go to when they need to connect with friends and family in different places. All they need to do is to have a Twitter or a Facebook profile. But apart from helping people connect with friends and family, social media can be a powerful tool with powerful growth potential for your business if used in the right manner. What matters most is how you utilize the tool for the benefit of your business, and at Rocket Marketing and Design, we help you achieve the success you want with our social media marketing Fort Lauderdale services. Rocket Marketing and Design offers you with a wide variety of tailored solutions to meet the exact needs of your business. We give you the liberty to choose between our conclusive packages or stand-alone products if you are interested in a specific area in social media marketing. With our services, you will achieve different goals such as creating buzz around your products and services, coming up with unique and meaningful content for your followers, increasing your follower or fan base, carrying out market research to find out the impacts of your products on services on the consumers, and helping in creating brand awareness so that you can become stronger than ever in the social media. We will primarily focus on creating and growing customized accounts in Facebook, Twitter, Google+ and Instagram. It is also important to note that unlike other social media agencies in Fort Lauderdale, we use only white hat methods to get real followers who will be happy to share and engage with you regarding your products and services. The fans or following we build in your accounts are not generated by bots. They are real people who are passionate about your products or services. The social media marketing Fort Lauderdale services provided by Rocket Marketing and Design come with a solid Client Market Exclusivity Guarantee. This means that when you have a contract with us, you don’t have to worry about us working for your rivals. We commit to working for you alone and we will not take similar tasks from business competing yours. Additionally, we commit to providing you with regular reports on the progress of the social media marketing services. These reports are to help you gauge if we are on the right track towards achieving your business goals. They are also crucial in helping us make adjustments to the campaigns so that you can get the best possible results. Are you ready to start building your business through effective social media Fort Lauderdale services? Call us now at 786 – 309 – 8333 or simply fill in our contact form and we will get back to you as soon as possible.